From one of the UK's most beloved and iconic brands, Cath Kidston, here are some travel themed playing cards. Ideal for long journeys. Cath Kidston is one of the UK's leading designers. From one small shop in West London in 1992, the brand has grown from a simple idea - to create beautiful, practical products- into a worldwide success story. 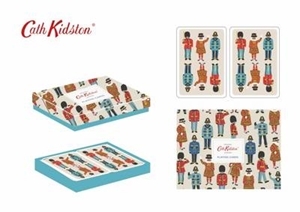 Cath Kidston kickstarted the trend for modern vintage and her must-have prints adorn everything from wellington boots tobabygros to lunch boxes.